*The remains of St Ignatius of Antioch and of St Clement I (d. 97) rest below the main altar. 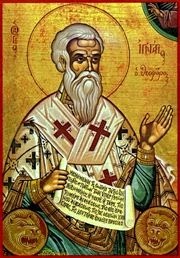 *Tradition claims that St Cyril discovered some bones and an anchor while he was in Crimea. These were believed to be the relics of St Clement I. St Cyril then carried them to Rome where they were placed in the Basilica of San Clemente.